Carry your Digital SLR Camera, laptop or tablet, camcorder and all photo and video accessories / equipment with ease and comfort. This rugged, multi-purpose camera case features a hard shell protection and multiple pockets for storage, offering convenience and portability for avid photographers on the go. Designed to fit a DSLR camera and several lenses including zoom lens, prime lens, telephoto lens, wide angle lens, kit lens, macro lens and many more. Keeps battery / cables / lens cap and other small accessories. Compatible with most 15.6 inch laptop, prevent devices from taking direct impact. Ease off the stress from shoulder, prevent discomfort from carrying overtime. *Padded Back Panel – The breathable back panel with extra paddings is shock resistant and eases stress on the back. The Velcro taped divider can be rearranged to suit users’ preference. Once removed, the backpack doubles as everyday carry bag or travel backpack. Package Includes: 1 x Backpack, 1 x Rain Cover. 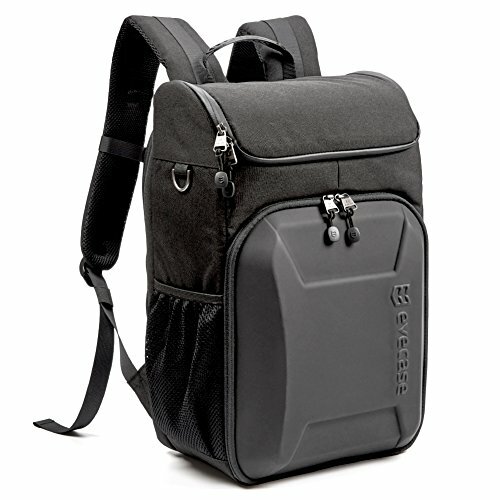 Evecase Hard Shell Digital Camera Photographer Backpack with 15.6 inch Laptop Compartment. [ EASY ACCESS ] Dual front zipper made access to your camera, lens in a breeze. Secure your camera and professional camera equipment from accidental fall out with added layer zipper protection. [ ERGONOMIC ] Extra padded Shoulder pad and reinforced breathable back support made hiking, travel, backpacking a lot more fun and easy. [ PRACTICAL ] Measure 11.8 x 8.7 x 19.7 inch, just the right size for under seat, over head bins for your next air travel. Include matching bag with handle and tripod holder to keep accessories organized.